The whole team at Ivy's is wonderful. They are responsive, helpful, and kind. I worked closely with Karen who always took my phone calls and answered emails with kindness and thoughtfulness. My husband and I planned most of our wedding, but Karen and the Ivy's team helped bring everything together. They are more than a caterer! The custom menu was so unique and excited us. No other vendor was willing to work with us on such a personal level. We received so many compliments from guests about the food, which paired well with our fall wedding and venue. 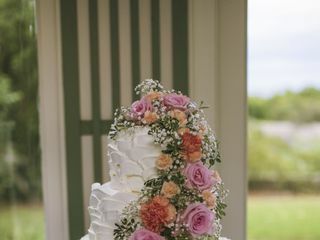 We also told Ivy's that we did not want the traditional wedding cake, they worked with a local vendor to supply pies, which again, our guests loved. There were menu customizations, tastings, checklists, and walkthroughs all provided before the wedding day. On the day of our wedding, the staff at Ivy's helped organize and direct our guests, they were attendant to my family and wedding party and always made sure we had what we needed. I would highly recommend Ivy's Simply Homemade and if I have another party/event to plan, I'd love to partner with them again. Thank you so much for having Ivy's be a part of such a special day for your family! Ivy's Homemade was everything we were looking for in a catering company. After looking into several local catering company's we knew hands down Ivys fit our budget, menu dreams and needs. Ivy, Sophia, Brook and all the team members were able to help us put together a wonderful, delicious menu for all 3 of our events. We used Ivy's for our wedding weekend including rehearsal dinner, brunch and reception! Its almost a month later and we have family and friends still commenting on how good it was. We couldn't have asked for better service, food, organization and helpful friendly faces! P.s. We also love to stop in to the shop on a busy night to grab a pre-made meal to go and pop in the oven. Blaze it was absolutely amazing being a part of your wedding weekend! From the creation of your menus to your wedding day, working with you to make every detail perfect was a true pleasure. Congratulations again! We could not have had a more amazing experience with Ivy’s. They catered our wedding at the Mystic Museum of Art. Karen, the catering manager, was warm, professional, listened to our ideas, and offered great suggestions. Each time we made an adjustment, Karen responded immediately. Her knowledge and expertise helped us plan a wonderful evening. We met Ivy and she exuded genuine enthusiasm for our wedding. She prepared menu options and served them to us. During the tasting, Ivy listened to our feedback and tweaked some of the ingredients to better meet our tastes. Ivy also created additional options for us to sample and made arrangements to cater to gluten-free guests as well. The food was amazing. The servers were professional and friendly. Our guests raved about the passed horderves, harvest table filled with cheeses, raw bar, and delicious sliced beef tenderloin. And to top off the evening party, the desserts Ivy prepared were decadently delicious. Ivy’s Simply Homemade treated us like family and helped make our wedding and party even more memorable. We give them our highest recommendation. Ivy's was amazing! From start to finish. Karen was helpful and timely during the beginning stages of my search for the perfect caterer. A few weeks before my wedding she would email me to check in to be sure I didn't need anything and would also remind of things that a did need. The day of the wedding the Ivy staff was professional, helpful and on the ball and last but not least the food was absolutely delicious! 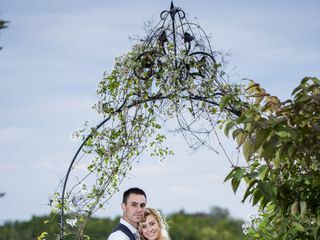 Everyone at Ivy's was absolutely amazing throughout the entire planning process, right through the day of the wedding. We had a tented backyard wedding and it rained cats and dogs but the team from Ivy's were still on top of every little detail. They were literally sloshing through the mud to make sure that everything was done to perfection. Our guests were not only raving about the food but also about how helpful Karen and her team were on the day of the wedding. Hiring them to cater our wedding was hands down the best decision we could have made! It felt like we were working with family the entire time. I am so glad we chose Ivy's! They really go out of their way to make sure that the food and the service are perfect. Excellent food, stress free, super accommodating! Overall an excellent experience for our wedding! We are so glad that your guests and you enjoyed the menu that we wrote. It was important to us that you had delicious food that accommodated your severe allergies. We love being able to make this aspect of your wedding a little easier! Ivy’s was the best decision we made for our wedding! They were so helpful, flexible and accommodating at every step of the way! Sophia was a life saver and helped our wedding day run smoothly. Everyone loved the food and it was exactly what we pictured. I would highly recommend Ivy’s Simply Homemade to anyone planning an event big or small. Ivy, Sophia and all of their staff really know their stuff and we can’t thank them enough for everything!! Susan, you and your family were a joy to work with for your wedding. Mystic Museum is such a beautiful venue to work in, especially in November. We are looking forward to seeing amazing pictures. Wish you and Zack the best! My husband Joel and I could not have had a more wonderful experience with Ivy's Simply Homemade. We worked with Karen, who is responsive, detail oriented, kind and lovely. Joel and I were immediately impressed by the professionalism of Ivys in our e-mail exchanges, and we were blown away by our first sit down meeting. Karen put so much effort into crafting a menu that was exactly what we wanted. Out tasting was a special event that we will always remember. Karen made every step of the process more enjoyable, and went above and beyond on numerous occasions (talking through the logistics of the day with us, coordinating with our other vendors, etc.) Joel and I are so grateful that we had the opportunity to work with Ivys-- it was truly a pleasure. Thank you Karen and Ivy! Thank you so much for your lovely review and kind words. It was wonderful to have had the opportunity to meet and work along with you and Joel in planning your very Special Day! Wishing you and Joel a holiday season of sweet moments and much joy! I absolutely love them! Karen and Ivy are amazing to work with, they're very responsive and extremely accommodating. The food is very good as well!! Thank you very much for letting us be a part of your day! When planning my wedding I was also finishing my final semester as a full time student. It was an overwhelming experience. Ivy's Simply Homemade is the perfect catering company! Sophia was so professional, friendly, attentive. I would have drastically different ideas of food and even if they were not in my budget she would still send me estimates for whatever I had asked for, trying to work in my budget as best as possible. Some of my guest had dietary restrictions and they were more than accommodating. There was someone who has celiac and another who was vegan gluten free and not only did they prepare them something special but made sure they knew their name and where they sat to give them their dish. Both approached me in shock for their accommodations. Sophia was also very helpful in the rentals, how much of something and which contacts to make. When I arrived early she was helping me unload and set everything up with her staff while I finished getting ready. There were never empty cups and the catering staff were super friendly! If I ever need an event catered this would be my go to! Or if I am ever passing by I will stop in for a quick to go! Thank you to everyone at Ivy's Simply Homemade for making the Rehearsal Dinner a special and memorable event. I felt very comfortable working with Karen and she it was evident that she wanted to present what we were interested in. It was great to be able to depend on Karen and her team and not have to worry about anything. You have made the whole process so effortless and I appreciate how you worked with us to create beautiful event. I found suggestions and ideas Karen shared with us to be more than helpful. The event preparation, the professional staff, the food (such tender meat and the four dipping sauces to go with the shish kabobs gave the meal a European flair! ), the food displays, the clean up (I believe the kitchen was cleaner after Ivy's left than it was before), and all the unthinkable details were handled with grace. The compliments still keep coming and it was because of you. Thank you so much! Thank you so much Susan! We look forward to seeing you soon! We can not say enough about how amazing Ivy's Simply Homemade is. From the very beginning, Karen and Ivy were there to help us through every aspect of the wedding planning process. Karen was always extremely responsive and there to help. The service at our wedding, from the cocktail hour throughout dinner and the reception, was exceptional. 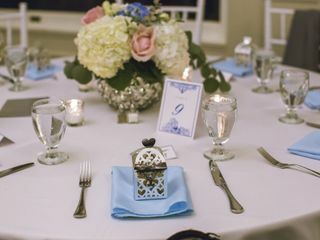 All aspects of our menu were carefully crafted and personalized, and we were blown away by the beautiful layout and decor of each stationary display and plate. Everything was absolutely delicious. The bar service was handled perfectly, with enough servers to avoid lines and keep the drinks flowing. Karen created a perfect timeline and her and Ivy were there to make sure everything remained on schedule throughout the night. Our wedding was almost 3 weeks ago and we are still getting compliments from our guests on service, presentation, and taste. Ivy's is a must for any event! Thank you very much for your kind words. I am so so happy for you two love birds! I can't wait to see pictures! We got married in September. Ivy’s helped us to put together a menu with great autumn flavors. Several guests told us it was the best food they’d ever eaten at a wedding - no bland roast or mashed potatoes here! They were so accommodating, helping us with all of the arrangements with the venue and the rental company, it was almost like having a wedding planner! We are so grateful. A big thank you to Karen and Ivy and the rest of your wonderful staff! Thank you Joey for your review. It was a joy getting to know both you and Russ and being a part of your special day! Ivy and I hope you stop by the shop one day soon for dinner, would love to catch up! My husband and I couldn’t be more thrilled with the exceptional service we received from Ivy’s catering! From start to finish, Ivy, Sophia, and staff, exceeded all our expectations! As many of you know, it can be very overwhelming planning a wedding on your own. Upon initial consultation, we felt very comfortable with their approach, attention to detail, and overall business structure. They were attentive to our needs and went out of their way to help us overcome any hurdle that was placed in our path. Communication was fluent and precise. Additionally, check-ins were frequent and informative, providing us with all the resources needed to make decisions we felt confident in regarding our special day. We had a blast at our tasting experience which allowed us to narrow down our selection from an impressive menu! Throughout the process, they were patient and understanding. Since we already had an idea for what we wanted for our cake, finalizing that decision was easy as Ivy’s was able to accommodate our vision beautifully. As for the big day, Ivy’s staff coordination was professionally and seamlessly orchestrated. Who needs a wedding planner when you have Ivy’s?! Ivy even helped coordinate the line-up at the ceremony itself. Our guests are still talking about the amazing food and impressive staff from our wedding. We are truly grateful and can’t say enough about our wonderful experience! There is zero reason to look for another caterer as you will not find better! We absolutely recommend Ivy’s for any catering event and would hire them again in a heartbeat for future catered occasions! Ivy's SH catered my wedding and they were amazing!!! They offered amazing options that were beautifully presented, tasty, modern, and fit within our modest wedding budget. We opted for the no-heat buffet to save money, and the food was so good that no one even noticed it was not a hot buffet service! They also work with an excellent cake vendor and the cake blew me away, it was so good. Our guests also said the catering staff were very friendly. The catering coordinator, Sophia, is so great to work with. She is organized and seems to have a lot of experience. She helped us with a lot of non-food related tasks, like getting the DJ set with the timing and unpacking boxes at the venue. I highly recommend ISH for wedding catering. They are really out to impress and to make you as happy as they can. Thank you very much for your kind words. We pride our selves on our personal service and I am glad this shined through Sophia and our services. We hope to see you again soon! If you are planning a wedding, hire Ivy's Simply Homemade now! They are hands down the best caterer in the business. I could not have pulled off a wedding for 180 guests without the expertise, caring, and support from Karen Bartelli and Ivy Mellow. They are simply the best. Our guests raved about the food both in taste, presentation and the wonderful and courteous staff who served our guests. We had a raw bar that people are still talking about and a cheese platter that was fit for a food magazine cover. Karen and Ivy are not only exceptional caterers, they are like mini wedding planners. We spoke on the phone for months and Karen gave me many pep talks and tips. I cannot say enough about them. I can't believe it's been almost 2 months! I hope everyone has rested their dancing feet and settled back into life! We look forward to seeing pictures if you'd like to send them along! We had an amazing experience with Ivy's! We started off having a meeting and discussing what types of food and service we were interested in. Ivy and karen then provided us with an incredible tasting. We sampled all kinds of delicious food and loved all of it. They were able to tweak a few dishes for us and the process was seamless. They are totally flexible with their food and will work to create whatever you are looking for. We had to change our venue at the last minute and Ivy's couldn't have been more accommodating. The service at our wedding was seamless. The staff was exceptionally friendly and helpful. Our guests commented on how great everyone was. The food was delicious and everything happened on schedule. My husband and I highly recommend Ivy's. They helped make our wedding perfect!! Thank you for your lovely review! Ivy's enjoyed being a part of your day...it was magical! The change of venue turned out to be the perfect spot for your special celebration and it was a joy for our staff to help bring it all together! Ivys Simply Homemade was Simply Amazing!! Not only did we get many compliments from our guests on how great the food was, Sophia was very helpful and was there to guide me step by step to get through my planning...they were much more than just a caterer, I don't believe the night would have gone so smoothly without their help! I would recommend Ivys to anyone that asked. They provide quality and professionalism to the highest standard! Thank you for this perfect review! I am so happy you all enjoyed your day and look forward to seeing you again! Karen and the Ivy's team are the best! 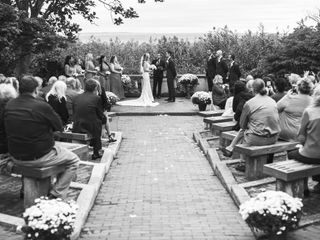 I hired Ivy's for my wedding this past August at Eolia Mansion at Harkness State Park and I could not think of anyone better for the job than Ivy's. 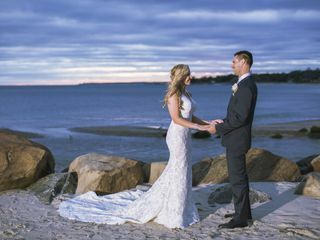 Getting married and having a wedding reception at Harkness was no easy feat without a wedding planner but Ivy's was experienced with the venue and answered so many of my questions leading up to the wedding and even the night of! Ivy's food is delicious and months later our guests are still raving to us about the food at our wedding (we had a buffet with a variety of choices). Ivy's worked with us until the menu was exactly what we wanted. Ivy even made adjustments to our pasta dish we tried at our tasting and invited us to taste it again to make sure it was perfect. What made Ivy's stand out the most, though was how kind and genuine their whole team was throughout the entire process. They made us feel like we had known them forever and one of the servers on the Ivy's staff even helped my bridesmaids bustle my dress in a pinch. I'm telling you... These people do it all! 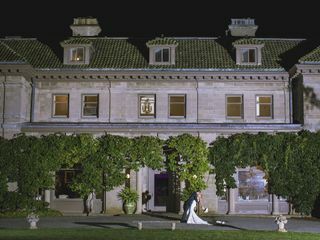 I whole heartedly recommend Ivy's especially if you are having your wedding at Eolia mansion! Thank you so much for this kind review. Karen really is a dream to work with and Renee was pretty proud of her bustling skills! We have a pretty great team if I can say so myself! Again, thank you! My husband and I enjoyed working with Ivy's Homemade Catering for our wedding. We had a budget of how much we wanted to spend and Ivy's worked with us to cut costs, and still make our day perfect. We couldn't have been happier with another catering team. They were very professonal and when our big day came they did such an amazing job. They even made sure my husband and I made time to sit and eat in the midst of all the business and celebrating. I 100% recommend Ivy's Homemade Catering. Thank you for taking the time to review our services . It was our pleasure to work with you on your dream day! Enjoy married life! I honestly cannot say enough about Ivy and her team. From the start they are so easy to work with and you can tell they love what they do. Ivy catered my daughter's wedding on May 29th and it was amazing! Not only was the food fantastic the staff is outstanding. Karen, you are amazing you kept everything flowing smoothly we did not have one worry and that was such a blessing. Everyone went above and beyond what was expected down to the little details that made Kimberly's reception extra special. Our guests are still raving about the food and the friendly staff and how professional they are. The presentation of the food was gorgeous with all the special touches here and there. We had quite a variety of food and it amazes me how perfectly everything was done. That just shows what an amazing and talented team they are and the passion they have to create a flawless event. I wouldn't have any other caterer for an event Ivy's is simply the best! Thank you all again! One of my favorite mother of the brides I've worked with all year! You have raised an amazing family and we appreciate all your kind words and letting us be a part of Kimberly and James's special day! It was so beautiful with all your handmade pieces and works. Just beautiful! I really cannot say enough wonderful things about Ivy and her team. Not only was the food delicious, but they truly went above and beyond and our wedding day was absolutely perfect. Mike and I ended up losing our original venue about a month before our wedding date. We were heartbroken, but not for long because we had Ivy! She took it upon herself to call every vendor in the area determined to find one that was available for our wedding date. Fate had it that the Mystic Museum of Art was available and Mike and I booked it right away. The last minute venue change was no problem for Ivy and Sophia and the rest of the team. They were professional, organized and ran the day in such a calm and friendly manner Mike and I were completely stress free and trusted their guidance 100%. We had so many compliments on how amazing the food was, how smoothly Ivy and Sophia kept the day flowing and how beautiful the venue was. I could go on and on about all the major things they did for us, but it's more than that, it's the small things that makes Ivy stand out above the rest. For example, we had a buffet dinner so Ivy and Sophia made it a point to prepare a plate for my 90 year old great aunt and 87 year old grandma so they could relax and not have to worry about carrying their plate to and from the buffet table. Such a small touch, but makes a huge difference. 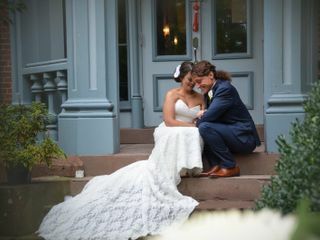 We wouldn't change a single thing about our wedding day, it was perfect and we have Ivy and her team to thank for that. Everyone just worked so hard to make sure it was special for Mike and I and we are extremely thankful for every minute of it. Without a doubt we would recommend Ivy's Simply Homemade to anyone and everyone. It was such an honor to be a part of your day, Everything turned out so perfectly! You two are such kind, heartwarming people. We look forward to seeing you soon! We had our wedding at Rocky Neck State park, where Ivy's is one of four approved caterers. First things first: the food was AMAZING! Guests came up to our sweetheart table to compliment it, and two weeks later we are still getting comments! Sophia, our coordinator, answered all our questions, gave great advice on how to stay within our budget, and kept us on task during our relatively short planning timeframe. When the day came, we knew we could relax and enjoy it while she made sure everything ran smoothly. Ivy, the owner, was also very present, taking the time to consult with us during the tasting and check in during the event. On the day of, one of the servers acted as a personal attendant, making sure we always had the drinks of our choice and got to actually enjoy our cocktail hour food. I was on an extremely restrictive medical diet when we signed our contract, and Ivy's committed to making at least all of my food totally safe without compromising flavor. I am allergic to olive oil, so this was no easy feat, and it was definitely achieved. Our complicated alcohol situation is a perfect example of Ivys' flexibility. My religion forbids drinking, so a fair number of our guests were teetotalers. On the other hand, my husband is a connoisseur of dark beers, and our family and friends of course have a variety of tastes. For the nondrinkers, Ivy's made a great fresh lemonade and virgin mojitos, my favorite mocktail. 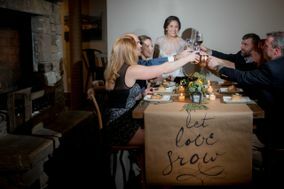 For those who imbibe, we selected six wines and about ten beers, which Ivy's transported to the venue and served for a very reasonable handling fee. The total cost we indicated includes food, staffing, tax, and the handling fee, but not the cost of alcohol since we purchased that ourselves. Samantha and John, I can't believe it's been almost six months, feels just like yesterday! I thank you for taking the time to review our catering. I appreciate your kind words, hope you are enjoying married life!